Aeroplan is once again running a discounted offer for transferring miles between accounts. Normally it costs 2 cents per mile to transfer to another account but until June 4th you can do so at 1.5 cents per miles. Still not the best deal but if you have some stagnant miles that can help another account reach an award level it may be worth it to do so. Find out more here. 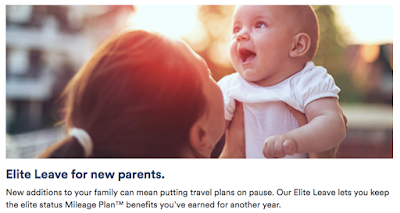 Alaska Airlines Mileage Plan has followed in the footsteps of Air Canada Altitude and British Airways Executive Club by offering Mileage Plan elite status members an option to extend status if you stop travelling for pregnancy or parental leave. Find out more here. 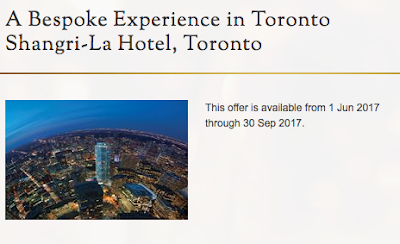 A Bespoke Experience in Toronto at the Shangri-La Hotel, Toronto. When you book by 31 July for a stay through 30 September 2017, you'll receive: Complimentary high tea for two at the liveliest Lobby Lounge in the city Exclusive walking tour of downtown Toronto for two Members-only souvenir to always remind you of your stay. Find out more here.